In the article I shall result result of the decision of a problem on the organization of routing between virtual machines on VMware with use MikroTik CHR, and with the organization of access on VPN to virtual machines from an external network. with the second come two VLANs - one for access to the internal network of the organization and with access to the Internet, from the second come real addresses. In order to no longer use the organization's address space, you need to define your own address space within the server for a resource of 3 virtual machines and close the resource to access other resources from 3 machines. It is necessary to block traffic from virtual machines, which does not go to a proxy organization. Each resource of the three virtual machines is designed for one person, it also needs to be granted access to work from home. The server is VMware ESXi ? MikroTik CHR ?? ?r3r364 will be used for routing. As already defined, two VLANs come to the server, one will serve for access of virtual machines to the organization's network and Internet access through the organization's proxy, the second one is necessary for having a real address and access to virtual machines from outside. Each interface created is tied to a virtual machine with MikroTik CHR and to 3 virtual machines from the pool. For example, for machines with the identifier Student # ? 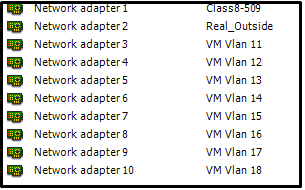 the virtual interface of VM Vlan 25 is assigned. Initially, we will define understandable interface names and give comments for understanding which interface to which virtual machines pool is intended. set[find default-name=ether4 ]comment = "Interface VM Vlan 12 for Student # 1"
set[find default-name=ether6 ]comment = "Interface VM Vlan 14 for Student # 3"
set[find default-name=ether7 ]comment = "Interface VM Vlan 15 for Student # 4"
set[find default-name=ether8 ]comment = "Interface VM Vlan 16 for Student # 5"
set[find default-name=ether2 ]comment = "Interface Vlan 1111 Real_Outside"
Each interface will be assigned an IP address, including an interface that will have a real address. Define a set of networks. In each pool of machines on one virtual machine, Windows Server 2012 is installed on which AD and DNS are configured, so for each network, the IP address of this virtual machine will act as DNS. For each interface, we define an address pool that will be issued by the DHCP server and activate Add ARP For Leases . This prevents the IP address from being assigned to the virtual machine. Add ARP For Leases - Creates a MAC-IP mapping in the ARP table for clients who have leased from DHCP and allows you to organize MAC filtering with the IP /ARP on a microphone. Since it is necessary to provide access to virtual machines from the Internet, we will immediately prepare an address pool for clients when they are connected via L2TP /IPsec. In the new versions of RouterOS, it is possible to create lists, so we integrate all local interfaces into one list to facilitate the configuration of the firewall. Define the list of IP addresses of the proxy and in the firewall rules, we indicate that traffic from all local interfaces, if it does not go to the addresses of the proxy, will be blocked. Immediately specify the rule to disable ICMP and block traffic between local interfaces. add action = drop chain = forward comment = "Block If Not Proxy Address"
add action = drop chain = input comment = "Block ping"
add action = drop chain = forward comment = "Block ping between interface"
We also define NAT, in which all traffic from local addresses will be exited through an interface that looks at the organization's network. To organize access from an external network, activate the L2TP server and create for each user its credentials and its own interface. Each user can create only one connection at a time. Since, some users use Windows 1? in the security settings in addition activate the 3DES encryption algorithm. In the firewall settings, we specify that each user can only access his network (on a specific local interface) on specific ports (RPD and SSH) and block any other traffic. Additionally, we allow access for l2tp from the interface that has a real address. To ease the load on the organization's network, for each user we will make a speed limit. As a result, we get the following settings, I will give some settings for one user. 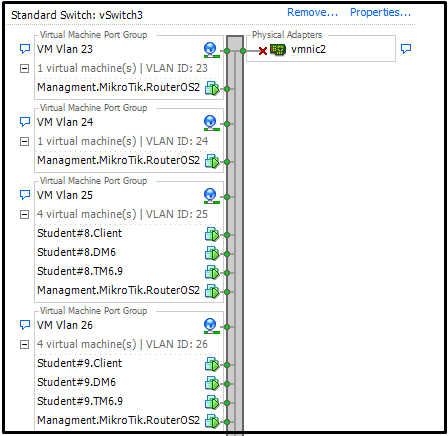 add change-tcp-mss = yes comment = "Student1 Profile for L2TP, Rate Limits 3M /3M"
add action = accept chain = forward comment = "Student # 1 L2TP to Vlan 12"
In addition to configuring the connection on the client's home machine, the client additionally registers the route to the network allowed to it, however, thanks to the rules of the firewall, if the client has indicated the route not to its network, then it will not be able to access the virtual machines of the specified network. Since we have two Internet connections, we need incoming traffic to be sent correctly back through the desired interface. Therefore, we use the capabilities of Mikrotik in traffic marking. add action = mark-connection chain = input comment = "Mangle Real_Outside traffic"
add action = mark-connection chain = input comment = "Mangle Class8_509_VM Traffic"
add action = mark-routing chain = output comment = "Rout out Real_Outside"
add action = mark-routing chain = output comment = "Rout out Class8-509 VM"
Since our MikroTik has a real address,then there are attempts to select a password from the Internet via the SSH protocol, so in the firewall we will add a number of rules for blocking such IP addresses. At the time of this article, there were about 400 addresses in the lock lists. As a result, we get an adjusted virtual mikrotik on the output, which performs traffic routing, provides the ability to connect from the Internet via l2tp /ipsec and has firewall settings for distinguishing users and interfaces. Im surprised that with every network technology you guys have you have nothing in comparision to dissertation writing service at all, like why is that? You should have looked into this if you ask me ! Experience of using Mikrotik CHR for virtual routing is always a good experience for the writers. As a writer of different professional paper writing service projects i will share this blog. So more people will know about it. Trim is a decent calling for each one yet in young guardians should focus on children instruction not at other's exercises. In any case, if child's are great in my assignment help reviews work or in concentrate then they should picked any petitioned for their future calling. This post shows nice details. I like the way you analyze issues windows 10 application.